THE annual New Year Swim at Rhu Marina at noon on January 1 2011 raised a record £1,183 for the local RNLI station. The event, organised by Provost Billy Petrie of Argyll and Bute Council, his wife Jean and his family, attracted some 170 swimmers, 40 down on last year. But the large crowd donated generously and took the total in the years the swim has been held at the marina to £9,500. 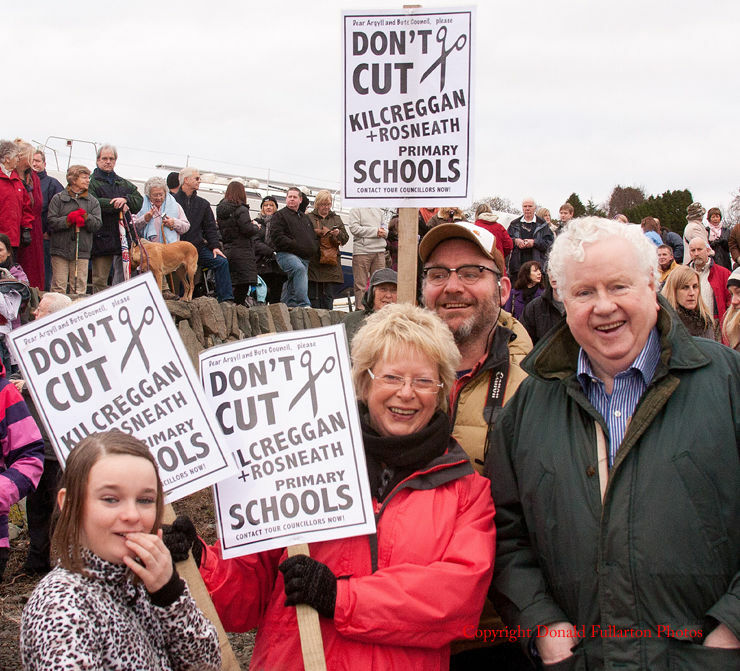 In a good-natured protest, several spectators carried placards calling on the council to save Kilcreggan and Rosneath Primary Schools, which are threatened with closure in education budget cuts, and one of the swimmers carried two lilos with the message ‘Save Our Schools’. After taking the plunge into the Gareloch the swimmers were given hot soup and received the traditional ‘Many are cauld but few are frozen’ certificates signed by Provost Petrie and sponsored by Helensburgh firm Admin Systems. The annual RNLI quiz competition was won by Mrs Jill Fulton of Rhu, who received her prize just before the event began.